A BLACKBIRD PRODUCTION: STEEL MAGNOLIAS by Robert Harling at the Seymour Centre. I had never seen any of this work’s previous incarnations. I came to it “a virgin”. What drew me to this production was the casting, particularly, the chance to see, with due respect, some of the great “war horses” of theatrical talent of my times in the theatre. Especially Jacki Weaver, Jennifer Hagan and Geraldine Turner. Not only was I excited by the prospect of them individually but as a collective team. I anticipated a rollicking and positively ‘naughty’ time of these three hugely talented and gifted actresses strutting their stuff on stage. I was not disappointed by them. It was the play that they had to work with, that unfortunately, shows its old fashioned ‘creakiness’ at almost every turning point in its narrative structure and plotting of ‘homespun’ humour. 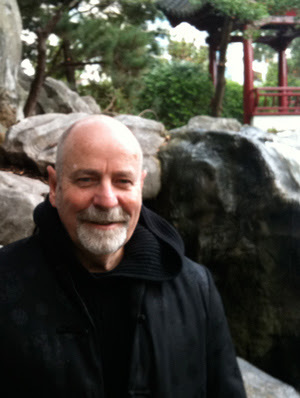 Afternoon television at its gentlest and most obvious – writing that is of a by gone time –already!!!! Without these three women on stage the play would hardly have been alive. It demands skill of a very special and seasoned type, Ms Weaver, Hagan and Turner have it in bucket loads. (Chutzpah as well.) Supported by Ana Maria Belo, Marian Frizelle and Debra Lawrance (who was especially good, up until her final scene – it needs centring and stillness, in my estimation. ), the performances are the reason to go. I should note that the audience, mostly women, seemed to respond empathetically to the piece and were moved, some of them to a few tears, by the journey of the characters. 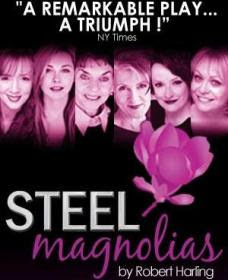 STEEL MAGNOLIAS is a gentle commercial piece of theatre well done. The producer’s Suzie Franke & Matthew Henderson of BLACKBIRD PRODUCTIONS have “the invaluable support of Playing Australia and Arts Victoria” that “will ensure that many Australians will” see this play “over the coming six months at 30 venues nationally”. Terrific that it is happening. I hope the targeted audience come in droves. It is, as one of the characters say “women’s territory” but I had pleasure in seeing six women on stage getting the opportunity to strut their skills and their love of performing. SIX WOMEN, how amazing is that.